The biggest feature in SEO Booster is the tracking of hundreds of search engines and the keyword information they (sometimes) bring. Each visitor is tracked, and any keyword information they bring is stored in the database. The keyword page is where you can look up all the keyword information given from the hundreds of search engines. The keyword table is AJAX based and works fast, you can sort by Keyword, Landing Page, Search Engine, Visitors, First Visit and Latest Visit. You can choose how many keywords to show per page and also search for keywords or URLs. You can choose between all keywords, pages where keywords are known or to show pages with unknown keywords traffic. The checkbox "Hide internal searches" shows and hides internal searches. 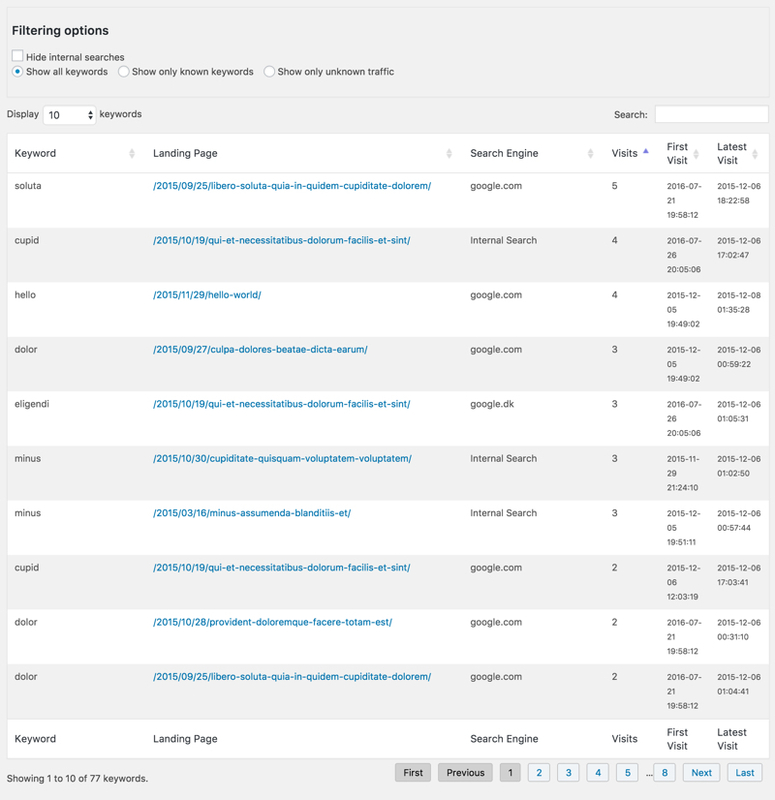 The internal searches are when visitors search on your website. This can help give a better overview of your content but does not show how search engines are sending traffic to you. Note: From version 3.3.15 your settings are saved as cookies, meaning next time you visit the keywords page the setting of hiding internal searches and your selection of which keywords to show are saved. The most popular search engines for your website. SEO Booster works retroactively if you upgrade from Free to Pro. That means as search engines are discovered and added to the master list, a daily maintenance routine goes through all register backlinks.